“In 2011 my first book, “Thunder Dog, the story of a blind man, a guide dog, and the triumph of trust”, was published. Since then I have received thousands of requests to publish a book for kids. 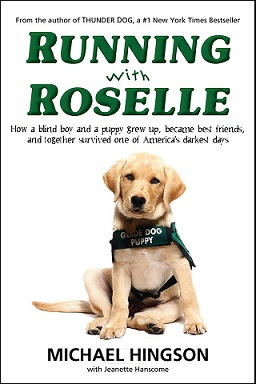 “Running With Roselle, How a blind boy and a puppy grew up, became best friends, and together survived on one of American’s darkest days” is the result. When I began the Children’s book project I had an advantage I never had with “Thunder Dog”. Although I worked with co-authors on both books I did a lot of the writing myself. My advantage with the second book was ALT. ALT is a system that allows me to create quick commands to speed up various repetitive processes I need to perform on my computer. Also, ALT allows me to create word groups, phrases, and even whole sections of writing I need to use several times. A blind person functioning in a world constructed for sighted people soon learns that it is possible to do almost everything that is done with sight by using alternative techniques. Some are more efficient than the techniques used by our sighted friends and family, some are about the same, and others are slower. In employment, efficiency is the name of the game, so part of what we must do is, not only demand accessible hardware and software, but find ways to make it efficient. Sometimes this is accomplished by working with designers to ensure that we can do with a series of keystrokes what is done with a mouse or some other pointing device. Sometimes it is done by special software that bypasses the visual paradigm altogether. This article discusses one productivity tool blind people can use at home and in the workplace to perform often-repeated tasks efficiently. ALT is a program developed in Germany by Dräger & Lienert Information Management, and distributed in English-speaking countries by U-R-Able. ALT was specifically developed for the blind by developers who are blind. Briefly described, it is productivity software that simplifies repetitive tasks, provides keyboard shortcuts for complex operations, and provides keyboard commands to emulate mouse functions. ALT works with all screen readers. For JAWS, Window-Eyes, and the Cobra screen-readers, ALT has over 200 built-in functions to direct the screen reader programmatically. It will work with any Windows-based software. Some examples of how ALT is used are shown below. ALT is activated, as you might expect, by pressing the Alt key on the PC keyboard. Since Alt by itself is already used to perform many functions, the ALT program actually requires two taps of the key, followed by the command ALT is to perform. Suppose you have trouble remembering the website for the National Library Service for the Blind and Physically Handicapped Braille and Audio Reading Download, BARD. An ALT accelerator can be defined and given this address once, and from then on all one need do is press Alt twice and enter BARD or NLS or whatever mnemonic one wishes to assign for getting to the service. An accelerator can also be activated with additional information. For example, the accelerator for BARD could be called “bard.” The bard accelerator would be supplied with a user name and password. For example, “bard <user@mail.net> booksplease”. ALT will bring up the BARD site and log the user in. The same trick will work for Bookshare. Two presses of the Alt key and the letters “bs” followed by Enter will bring up Bookshare, and this can be configured to load the login page, a search page, or any number of other options Bookshare offers to use its service. The neat part of the ALT accelerators for screen reader users is that all the “journey steps” we’re so used to hearing are silent with ALT. I personally use Google at least ten times a day: how does Freedom Scientific spell “PAC Mate” or Humanware spell “BrailleNote,” in what issue did we last run a story about Christine Boone, or when did we give Ramona Walhof the tenBroek Award? I could enter <www.google.com> or could put Google in my favorites list; or I could use a nifty ALT command that not only takes me to Google but lets me enter my search term and even positions the reading cursor at the results of my search. A command such as “gs Jacobus tenBroek born” tells me that he was born in 1911 and died in 1968. The search is quick and easy and takes less than ten seconds to type and find the answer. Of course ALT cannot guarantee that the search criteria will lead directly to the desired item, but it can make the process of initiating that search quick and easy. The same method used with web addresses will also work in searching for commonly used files and folders. If I want the telephone directory used at the Center, I use the word “center” and the name of the person for whom I am searching, and instantly the Braille display contains his or her name and extension. More complex tasks can also be assigned to ALT. If one wishes to sign into his bank account and determine what the bank believes to be the account balance, ALT can be programmed to go to the bank’s website, login with the ID and password of the account holder, press the buttons or activate the links necessary to display the balance screen, and then search for the text that appears before that all-important number. For the professional ALT can be a real time saver. For example, when composing email, I can have various text modules for inserting contact information at the end of a letter. If I type “rsj” my contact information is inserted. I could have another module to insert contact information for both my wife and me. Yet another module could be created to insert a signature for a business. ALT accelerators can be used to perform tasks for Microsoft Word. I can press ALT twice followed by “word,” and Microsoft Word will start. I have accelerators for using Microsoft Word. The accelerator “inddec” will decrease the left margin. “Indinc” will increase the left margin indent. “Wcen” will center the current line. Other accelerators can adjust JAWS, the screen reader I am using. There are accelerators to adjust the announcement of access keys and tutorial messages, and for controlling a Braille display. ALT will also work with ZoomText. Users have the choice of purchasing packages of accelerators or creating their own. A very important feature of ALT is that I don’t have to be at the Desktop. ALT will work from anywhere on a PC. They call this “beaming”, moving from any starting location to a final destination in a single step. “As an Accessibility Consultant, I work with website developers to ensure the end product is fully accessible to all users. The universal design techniques used require a great deal of testing, so as to include the many different browsers, user agents, and mobile devices. Universal design is complex and often misunderstood, but more importantly it’s the law – it’s too often ignored and it’s simply the right way to provide information. I work with developers globally, many far outside my time zone. In a perfect state we needed a method to record on-screen activities including visual representation of a braille display, screen reader audio, system audio and human narration to demonstrate, in an inclusive medium, how a sighted, low-vision or blind person would interact with a website. The perfect-state didn’t exist as the combination of all these elements, due to issues of inaccessibility. We solved that with ALT and an otherwise inaccessible, though commonly used, product called “SnagIt” from Techsmith. ALT provided all the hooks necessary to bridge the accessibility barriers but also provided the means to complete complex selections required even for sighted-users into a single-step process. SnagIt provided the core engine to connect screen, audio and video into a well-managed production. As an aside, we have offered to work with SnagIt to correct their product. With minimal assistance from a sighted person I was able to create an ALT accelerator that will stage the recording, allowing me to proceed with video capture with my narration, Jaws voice, Braille display information shown, pause the recording, restart the recording as required and complete the process ready for distribution stored in the place and the naming convention of my choosing. Sounds like a lot, but it’s made easy with ALT. Now I can easily illustrate, to teams with vision or without, locally or internationally spanning time-zones, exactly the points of discussion just as if they were working beside me. The ability to illustrate a website activity including what’s seen by eye, what’s projected to the refreshable braille display and what’s heard with Jaws – (sometimes not equally which is a problem!) is a powerful an new tool for me as a blind team-worker. If a picture is worth 1000 words, a video is worth many times more, universally. * Having only used the ALT software itself for a couple of months, sky appears to be the limit to its application and utility. I have found it powerful and intuitive and can see how it can cater for the keen experimenter, the power user as well as those who are perhaps a little tentative or less experienced. * The support I have received has been of the highest quality with lots of direct contact with the main folk at U-R-Able. The training I have received formally and informally has been well tailored to my needs and skill level. It’s like being taught a cool but achievable song when first learning a musical instrument; training is made interesting due to the direct application to a problem or an enabler relevant to my situation. * I find it extremely satisfying to develop my own Accelerator “Jobs” to meet one of my specific needs knowing that the ALT team are only an email, or even a call, away if I run into trouble or need a nudge in the right direction. They obviously have a deep well of patience and are easy going and easy to get to know. I have been treated with nothing but respect and they are great at listening. * The ALT team love a challenge and are happy to send out little challenges to those wanting one. A difficult situation is not a road block, or even a hurdle to the ALT team, it is a challenge to be solved and conquered. * It is clear to me that the people driving U-R-Able are mega-clever, passionate, innovators, embracers of technology and committed to their product and to their clients. * The use of DropBox, TeamViewer and Skype, for instance, allows for innovative and effective service and training delivery. * The U-R-Able team obviously have their fingers on the pulse and in the pies of many other interesting technology projects and are in touch with thinkers and innovators in the technology space. They are completely happy to engage and share information on things outside of just ALT with me if they know that I am interested in hearing about it. * The way the ALT software database can be shared through Dropbox enables IT staff in the firm where I work to create accelerator jobs using their skills, on their time and without the need to commandeer my computer. Their accelerator creations can then be easily shared with me. U-R-Able have encouraged us to be as self-sufficient as possible, so I predict that I will be able to draw on internal support as a first port of call in the very near future. * To be able to achieve in just a few keystrokes something that may have taken tens or even hundreds of keystrokes to do is extremely liberating. For instance, I have created an ALT accelerator that will launch my Internet browser, go to a specific online legal database, go to the piece of law I am after and even drill down to a specific section if I want. I can trigger this accelerator at any time and it all happens in a flash. There are many other examples, including interacting with our document management system in a far more efficient and far less frustrating way. 2. it allows me to do things that I could not otherwise do myself or do easily because the interface I am working with is not accessible … yet! * I would recommend ALT to anyone, period. No matter who you are and what you are doing on your computer, ALT can help you do it faster. Unscripted interview with David Burnett, CEO of End to End Networks in Markham Ontario Canada. David is a JAWS user and has been using ALT to accelerate his interactions with his computer. Listen for some unusual expressions for a screen-reader user: faster, fun and greater independence. David discusses how “Beaming”, (moving from Point A to Point Z in a single step) and the reduction of audio fatigue by not needing to listen to the screen reader causes him to say “it makes life so much more simple”. Unscripted interview with Garth Long of Cork Ireland. Garth is a busy sales representative with an international software company. Garth is a JAWS user and has been using ALT to accelerate his interactions with his computer. Listen for some unusual expressions for a screen-reader user: “ALT takes away a lot of areas where I could make a mistake”, “Helps with the HUGE redundancy of JAWS commands”, “gives me a psycological edge”. 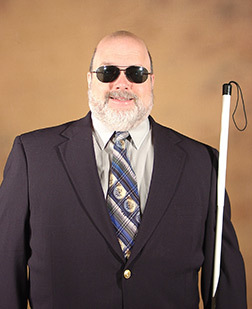 At CNIB we employ blind, low vision and sighted employees in our National Helpline. We implemented ALT (from U-R-Able and Dräger and Lienert) to accelerate access to information and workflows. Our six-month statistics illustrate that the performance of our blind and low-vision workers increased by 35%, quickly meeting the productivity levels of sighted team mates performing the same duties. The parity achieved resulted in balancing the work amongst the whole group which increased employee satisfaction. Additionally we achieved an increase in overall productivity resulting in increased customer satisfaction, without an increase in budgetary salary. We attribute these benefits to great teamwork and a great product, ALT. Tech Solutions for Visual Independence (TSVI) Tech Solutions for Visual Independence (TSVI) provides access technology solutions to People, Organizations, and Educational Service Providers. Frontier Computing Sales and service provider of assistive technology products for vision loss, learning disabilities, communication aids and physical access. My Blind Spot – The Clear View to Diversity Organization dedicated to helping visually impaired individuals live, achieve, and prosper. Echevarria Travel Leading the way to Independent Travel!